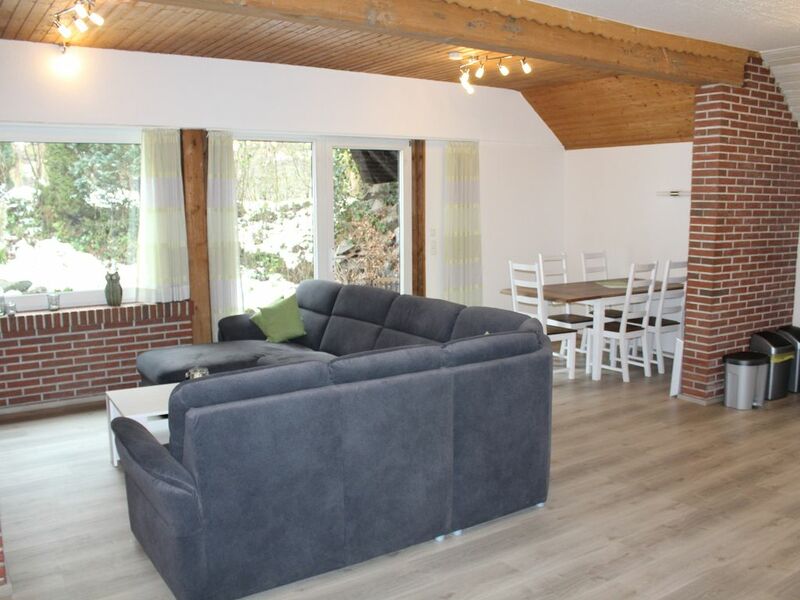 The quiet, cozy apartment EifelNatur 5 "Strohner Märchen" is located on the first floor of the house, is very comfortably furnished in country house style and is certified with 4 stars. The apartment has 5 beds in 2 bedrooms, 2 bathrooms with shower / WC, kitchen with dining area and large living room with electric fireplace. The complete bedding and towels we refer a laundry service. So we can offer you first-class, hygienic-clean quality. The cozy terrace in the countryside offers you a charcoal grill and a large table with chairs and invites you to linger and enjoy. On the common terrace and the grounds around the house there is a table tennis table and a children's playground with swings, slide and sandbox, and seating. Our fresh fruit basket with seasonal fruit, we have prepared a welcome for you, we want to ensure a healthy and pleasant stay in our home. In our self-service bar offers beverages (beer, Radler, sodas, soft drinks, wines), snacks (peanuts, chips, salted biscuits, olives), jams, milk, coffee, bread, pasta and pasta sauces. We also offer a sandwich service. You can choose from a wide selection of rolls and bread, order. We provide you with fresh bread in the morning to your apartment. The area offers a lot of nature to find peace and relaxation, hiking, cycling and mountain biking. The Vulkaneifel offers some beautiful maars. The two closest ones are within walking distance: the 'Immerather Maar' is a nature reserve, the 'Pulvermaar' offers a bathhouse, restaurants and a boat rental. Two zoos, the 'Game and Adventure Park Daun' and the 'Eagle and Wolf Park Kasselburg' are interesting destinations as well as the 'Nürburgring' and cities such as Cochem, Trier or Luxembourg. For a really good start to your day, our morning bread service provides: We deliver the desired rolls - deliciously fragrant, fresh and crispy. In the next building you will find an information wall with brochures about activities in the area. In the village there is a bike rental where you can rent different e-bikes and mountain bikes. For more information, we are happy to help. Marion and Andre will make your stay feel so relaxed. A home from home equipped with two bathrooms, lovely spacious bedrooms and a sofa to die for (all four of us could lie on it), they also provided bin bags, dishwasher tabs, just about everything you need. Immerath is a lovely picturesque village and close to amazing family activities from the longest footbridge, tiger sanctuary, and the wonderful towns of Koblenz and Cochem. At the price, this is a steal, and if you have active kids there is lots to do on site from table football and pool to paths into the hills. We wouldn't hesitate to recommend this place. The owners even turned up with easter eggs for the children. Perfect. Eine sehr schöne geräumige Wohnung zum Wohlfühlen, sauber und sehr gut ausgestattet. Die Gastgeber waren sehr freundlich und hilfsbereit. Schön in der Natur gelegen, 30 min zum Nürburgring. Sehr zu empfehlen. We stayed one week in the house below (nr. 5). It is a nice and very spacious house (perfect for our little daugther to crawl around! ), but unfortunately the house is a bit dark; there's not much sunlight coming to the house. The house is perfectly equiped (including baby bed and baby chair), the bedrooms, bathrooms (2!) and kitchen are beautiful and clean and have all the things you need. The terrace outside isn't very big and there is a short stairway to the playground, but because we were away a lot (there's so much to do and see in the area), we didn't really use it a lot. Andre and Marion are very friendly, take care of fresh buns every day and make you feel at home right away! Immerath is located in the heart of the volcanic Eifel between Koblenz and Trier. The Nürburgring is around 30 km away and the Moselle is only 22 km away. Cities such as Trier, Luxembourg, Cochem, Bernkastel-Kues and Traben-Trarbach are max. an hour's drive away. The thermal bath in Bad-Betrich is 13 km away. There are shops in Lutzerath and Gillenfeld, both about 5 km away. In the village there is a bike rental where you can rent different e-bikes and mountain bikes. For more information, we are happy to help. Bei Buchungen von 2 und 3 Nächten kommt ein Aufschlag in Höhe von 10 % auf den Übernachtungspreis hinzu.